Post Traumatic Stress Disorder, or PTSD, was first “discovered” during and after the Civil War in America. In Europe, PTSD is known as the KZ-syndrom which many prisoners developed after experiences from the Nazi Concentation camps. 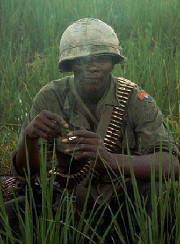 However, it was after the Vietnam War that Post Traumatic Stress Disorder became a common syndrome among war veterans. However, PTSD as a syndrom does not directly have a link to the Vietnam War or other wars. Actually, PTSD is a syndrom that many develop after terrorattack, accidents, torture etc. However, in most cases were PTSD is developed is during and after wars. 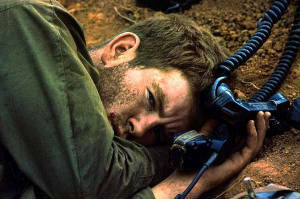 Therefore, a more specific name for PTSD after the Vietnam War is Shell Shock. PTSD, or Shell Shock, is a psychotic syndrom were the war veteran again and again get their experiences from the war through flash backs. Since a veteran with PTSD usually have problems sleeping, the flash backs comes as the person are awake. As the flash backs comes, fear and physical illness are common. However, there are situations that reminds the veteran about his/her experience from the war so that the flash backs comes constantly. Examples are action movies, airplanes and helicopters, a huge group of people and a common thing is that the veteran with PTSD can't handle to hear small kids scream. All of the above makes them think about their experience from the war, and as their thoughts and feelings are coming through, they try to avoid the thoughts. As this goes one, the veteran are often angry, intense, jumpy and hypersensitive. A long term effect of PTSD, is that the veteran develop for example scizophrenia and paranioa. There are man reasons why so many veterans developed PTSD during and after the Vietnam War. As the war went on, the troop morale became low, and many soldiers didn't know what they were fighting for. If you read a soldier's letter from Vietnam (see below), you can easily understand that the war was terrible for a 18- or 19 years old soldier. Already before soldiers were send to fight in the war many was against it, and the circumstances in Vietnam didn't make the situation better. Burning down villages with civilians, the jungle warfare against the Viet Cong and the Viet Minh, and the use of napalm combinded with low troop morale, made the Vietnam War as terrible as it ended up being. However, it was in the second half of the war that it really became hard to be a soldier in Vietnam. More and more civilans were killed because of using napalm, and during the Vietnamization, the only goal, according to letters from soldiers, was to try to stay alive. Although it often didn't happen after the Vietnam War, there are ways to prevent PTSD before a war, and treat a veteran with the syndrom after a war. Mental preparation and professional help during a war are two methods which is succesfull. However, it was happen after a war which is most important. The first thing to do, is to don't make PTSD as a taboo. It's important to get into the old, normal life again after a war, although it in many cases can very hard. Veterans are encouraged to talk about their experience to their families and friends, and professional help from a psychologist is also encouraged. However, in situations where the veteran seem to not getting over the war, drugmedicins are common. Therapy with a psychologist (groupstherapy where also the veteran's family attend is common) combined with drugs are most common in present time, since you can treat more people in the same time by using drugs. Most used drugs are Seroxat and Zoloft. However, approximately 40% of all who develop PTSD and treat it, will often get it back later. Also, it's hard for many to have a normal social life after developing the syndrom, so all in all, PTSD will in many cases forever change a person's life. I was out fighting today, and I am not very proud of myself, my friends, or my country. We burned almost everything we saw.. One of the other soldiers throwed a bomb in a little cottage, before we all ran away to hide for the explosion. Hiding, we all heard a screaming baby in the cottage, before the bomb exploded..After the explotion, we found the mother and a few weeks old baby. Their bodies were cut into parts... Well mom and dad, you wanted to know how it is down here, do you get an idea now?"